Is this Batch of fry Sakura or Not? Here i have some of my current 4 month old fry and they are looking like Matt fish (like their mother) but i have been kindly told by an experienced fish keeper in GK that they are sakura as sakura are Fish like Calico but with no hint of blue or black in them..
Searching for Good quality fish in Europe!! So far one no and one Unsure LOL No one else wish to comment on the subject?? or is it boring :bored .. They do have some reflective scales, but you can generally called them sakura. Sakura does not have a strict criteria. Well strictly in my humble and probably misguided opinion i would have used the Term Matt scaled as the fish a generally Orange or White and orange and have some reflective scales on them.. but these days they call matt fish with metalic scales Sakura.. Sakura is japaneses for Cherry blossom, ( I may be mistaken here) so should not a sakura fish be of white and red or pinkish colouration?? This terms are usually later used for similar Matt fish regardless of colour then?? 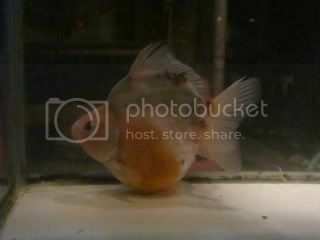 And what do you think of this fish Laulanchu?? one of the fish is metallic like his dad ( Red& white male by the looks of it). To me sakura is a matt red/white. Can't called a calico sakura though sometime you can find sakura in a batch of calico. They are decent youngs. If can improve on the tail spread will be better. In or out crossing depends on what you trying to achieve. 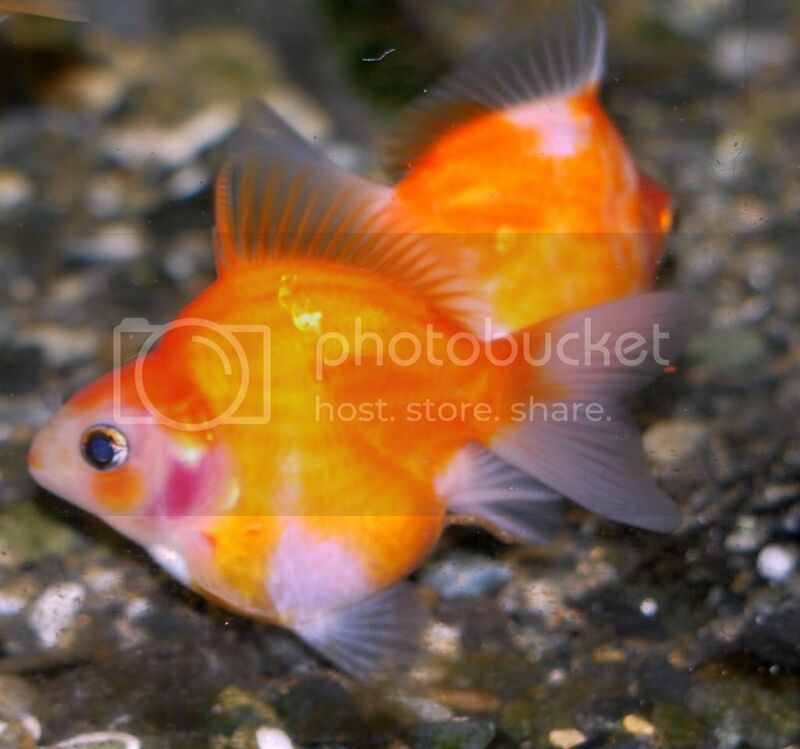 Hi Lau Lan Chu, yes in fact this fish come from a Calico decendant so strictly not 100% Sakura but looking just like the Sakura fish in several videos i have seen.. The tail spread is poor as the father/grandfather ( same fish) is a ST Ryukin and the Grand mother was a Fringetail, and the Mother a Tail inbetween.. The females had poor tales so need to cross out to better tailed fish, like my Chocolate/white ryukin. My aim is to get a nice all round ST Ryukin and as near to the Chinese standards as possible.. If I am not mistaken, calico must have the blue colour. The more the merrier. yes i agree with you in part, as Calico must have more than three colours on it and hence it must be a Matt fish ( scaless as you call them is not accurate as they do have scales but these do not shine and are just translucid) one of the colours that should be present is the Black pigment , which should not be present in Sakuras at all. 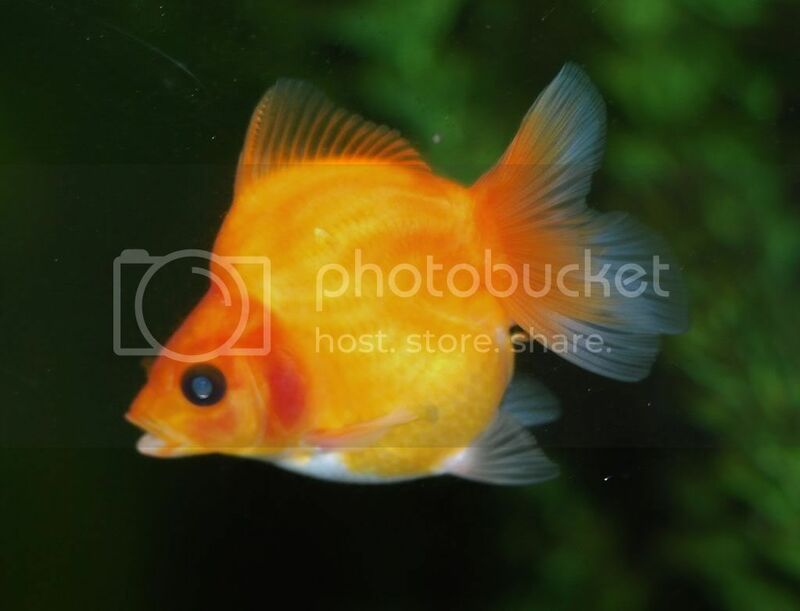 this pigment is the main one to give Black spots or areas on a fish, the greys and the blues too.., My fish once they started to change colour as they grew up lost the black pigment very early, becoming orange and white within the first two months of age.. So with this conclusion i agree with you totally HNLim calicos should be as varied in colours and as uniform in spread of this colours as possible.. all this on a white background so the fish has an interesting colour pattern.. There is a big market for Calico golfish. In fact, the art of calico appreciation is yet to be flourished compared to what has been documented in China goldfish history. i do urge breeder to look into this market seriously. Red, Yellow (orange), White, Black and Blue. The art of appreciation would be slightly different from the rest of the varieties, the main focus is the colour combination. If you don't mind, i would share my understanding from the documented criteria that i have been thought. * Blue, how far deep inside the layer of black that allows it to reflects a 'SKY' blue. * Yellow, perfect size yellow patches to complement one red patch. And it didn't stop here. For different pattern it has different variation of names. Example they have the 'blue base calico' as the name implies the base colour is base, and 'white base calico', 'cloud pattern calico', 'mudan calico' etc.... and the harder the pattern to produce the higher the value. There is proper Chinese name for these variation pattern, but i'm a lousy student, i cannot remember the names.